Though you probably didn’t hear it here first, it’s worth repeating; breakfast is the most important meal of the day. And although so many of you know this, you’re still coming up with cop-outs that stop you from eating this morning meal. Studies show that breakfast eaters have better concentration, attention span and memory which means better overall work performance. Plus, it’s been shown that those people that skip their am fuel are 75% more likely to be overweight than regular breakfast eaters. The best bang for your breakfast buck is a balance of protein, healthy fats and slow digesting carbohydrates that contain fiber. That’s easier said than done for breakfast-skippers. If you’re ready to commit, start small. A wedge of cheese and a piece of fruit is a good start, and you can build from there over time. Once your internal hunger clock has been reset and you crave food in the morning, you can build a better breakfast. 1.) Veggie omelet- Sauté a variety of vegetables in a pan with a little olive oil. Once they are soft, transfer the veggie mixture to the inside of your omelet along with the 2 Tbsp feta cheese. Balance it out with a side of berries and a slice of whole grain toast. 2.) Breakfast Wrap- Fill a whole wheat tortilla with black beans, 1/3 c whole grain rice and 2 Tbsp avocado and 2 Tbsp Salsa. Balance it out with a side of fruit. 3.) 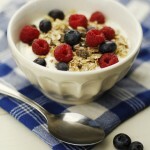 Greek yogurt- Mix some slivered almond and berries (or dried fruit) into 4 ounces of Greek yogurt. 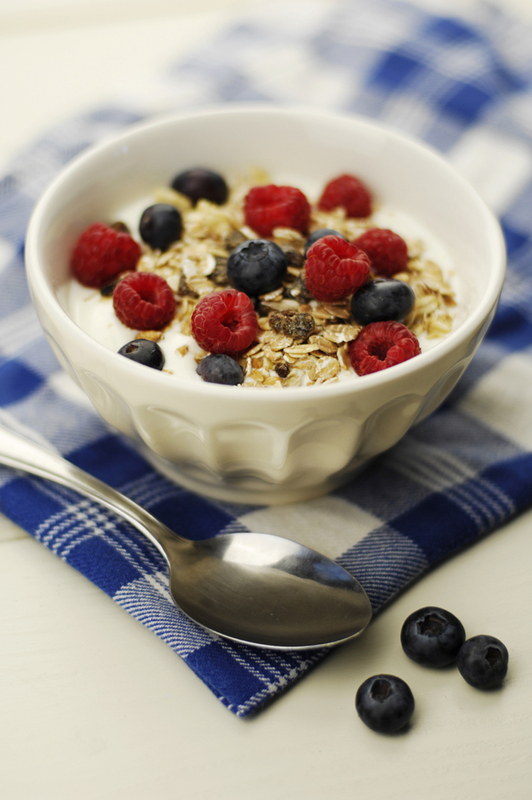 Balance it out with some low-fat granola or a whole wheat mini-bagel. 4.) Breakfast Sandwich- Layer 1 fried egg, 1 slice ham, 2 tomato slices, and 1 Tbsp hummus between a whole wheat English muffin. Serve with ½ banana. 5.) Hot Cereal- Make a meal of out your basic bowl of oatmeal by swirling in a mix of walnuts, dried prunes and cinnamon. Balance it out with ¼ cup cottage cheese for some added protein.